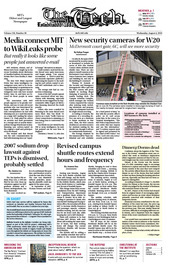 NEWS EDITOR; UPDATED WEDNESDAY 11:44 P.M.
On July 29, the span of MIT monitored by security cameras broadened to include the sector of W20 (the Student Center) where students await shuttle vans. There are also plans to install cameras at the McDermott Court vehicle entrance between East Campus and Building 66, and also in the Building 6C courtyard. Starting next Monday, August 9, the Tech Shuttle schedule and route will change, and the Northwest Shuttle’s route will be replaced by the EZRide Shuttle, which runs from North Station to Cambridgeport by way of Kendall Square. The Tau Epsilon Phi sodium drop case, a civil suit filed by two river clean-up volunteers against two MIT graduate students and a former undergraduate, has been dismissed.